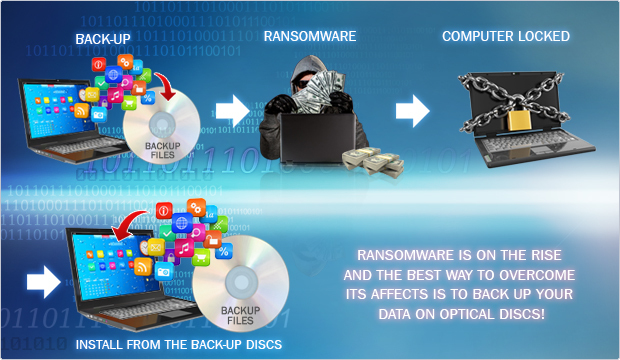 Ransomware is on the rise and the best way to overcome its affects is to back up your data on optical discs! There have been a number of stories all over the world recently about companies or organizations that have been held hostage by cyber criminals using specialized malware that locks up all the computers and servers on a network, preventing anyone from accessing any of the files or content on them. The content is not deleted, but simply blocked from anyone being able to access them due to very sophisticated encrypted computer programs. The company or organization is then asked to pay a ransom in order to receive a virtual key to unlock all of the content, (hence the name ransomware). In fact within the past few weeks, there were two public cases of a major city hospital and a major American city was attacked by a ransomware with two drastically different results. The Hollywood Presbyterian Medical Center, a hospital in Los Angeles, was hacked with ransomware and the hospital had no access to any of its patientâ€™s files or anything helps on the computers. Ultimately, the hospital had to pay the criminals for access as even the FBI was powerless to restore the content. In another recent case, the city of Durham, North Carolina, was also attached by Ransomware, but this time they didnâ€™t pay a penny because they continuously made back-up of all their files and simply restored their computers with the backed up files. The best way to back up all your files, especially for SMBâ€™s and individuals, is to back up your files onto optical discs. Optical discs not only allow you to recall and restore your archived content quickly, but they are impervious to viruses and outside attacks. Whether itâ€™s ransomware, spyware, virus, etc., making copies of your important and critical files onto discs just makes sense and keeps everyone protected. 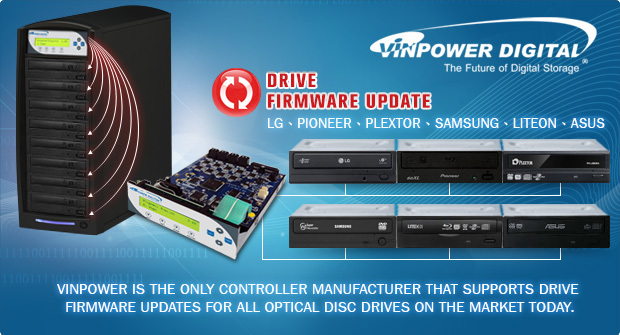 Vinpower has established itself as the premier manufacturer of standalone duplication controllers, especially for optical discs. We were the first to offer a wide range of unique and useful features and weâ€™re still developing new helpful features, particularly for heavy duplicator users. While our competition is either leaving the industry or significantly reducing their offerings and capabilities, Vinpower marches on to ensure that we still provide the exceptional quality and range of features and options that we have become known for. One of the key features that is critical, especially for heavy duplication users, is the ability to update the optical disc driveâ€™s (ODD) firmware (FW) directly through the duplicatorâ€™s controller. Currently, Vinpower is the only controller manufacture that offers this feature, which supports all internal ODDâ€™s that are available on the market today. Unfortunately, todayâ€™s ODDâ€™s tend to see more glitches and bugs than previous years, this is mostly due to the low cost nature of the ODDs and the manufacturerâ€™s limitations in time and resources to provide as wide of range of test as previously performed before releasing the drive onto the market. Most of the bugs are related to media compatibility or other easily correctable issues, but in order to correct the problems, the user must upload the latest ODD FW. For those with duplicators using a non-Vinpower controller, that means you have to remove each drive, connect them to a computer, and update them one by one. Thatâ€™s fine if you only have a small handful of drives. But if you have multiple duplicators with 10 or 15 drives in each one, then that process is going to be difficult and time consuming. With the Vinpower controller, you can update all the drives in the duplicator simultaneously in minutes without removing any of the drives. That saves a tremendous amount of time and hassle, keeping you focused on duplicating rather than updating. Itâ€™s far cheaper to store content on Optical Discs than in â€œThe Cloudâ€. Not only is an optical disc safer for your archival storage, but itâ€™s also cheaper to maintain as well. Often people donâ€™t think about the costs associated with storing content in â€œThe Cloudâ€, but over time it really adds up. Yet, outside of the initial cost for the disc itself, there are no residual costs associated with storing content on optical discs. It cost nothing to store an optical disc in a drawer for safe keeping, when you need it you load it into a disc reader and view the content instantly. Yet when you store that content on â€œThe Coudâ€, which is essentially just a server farm that a 3rd party controls, or even on your own servers, then there is a continuous cost that accumulates day after day, month after month and year after year. Servers require a lot of electricity to operate, both to operate and maintain the server but even more so for the air conditioning that maintains the serverâ€™s temperature and protects against overheating. Even if you think The Cloud is free, once you go over the small allotment of â€œfreeâ€ space, then many opt to pay a monthly or annual fee for greater storage capacity. It may seem fairly inexpensive in the short term, but rarely does anyone delete old content to make room for the new content, so those fees just continue to accumulate and escalate. Once you calculate those fees over the long term, then youâ€™ll see how these small fees can really add up and the more content you store the more the cost of maintaining it increases. Case in point, Facebook recently teamed up with Panasonic to create a whole ecosystem for offloading cold data (old content that is rarely if ever reviewed, but still needs to be available) from their servers and stored onto optical discs instead. 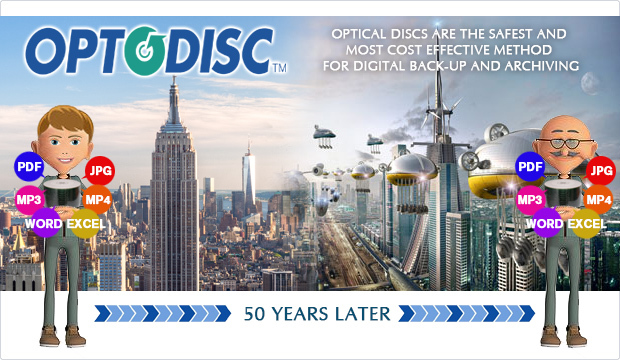 They invested in storing content on optical discs in order to keep the content safe and easily available, while freeing up valuable storage space on their servers for new data that is more frequently accessed. This application drastically reduces the overall energy demand, saving a remarkably large amount of money. 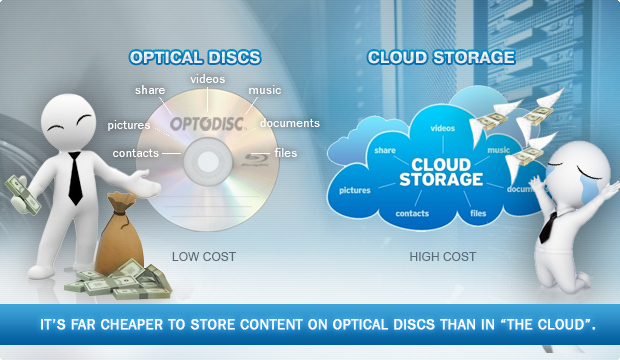 If it costs hundreds of thousands to millions of dollars to develop and implement this new cold data optical disc storage hardware and software, then you can imagine how much they must be spending on energy costs for that investment to make financial sense. You may not be on the same level as Facebook, but the key is there are expenses that you could drastically reduce or eliminate by reducing the content stored on in The Cloud or on your own servers by placing cold data on optical discs and storing them in a safe and convenient location. Iâ€™ve spoken on this topic before, describing why maintaining important digital files, like photographs, videos, financial documents, legal documents, etc., should be backed-up onto optical discs rather than just maintained on a hard drive or stored in the cloud. Iâ€™d like to further illustrate the importance and ideal method for archiving digital content onto optical discs. Firstly, why are optical discs safer than archiving that content onto a flash, hard drive, or in the cloud? The main reason is the fact that the content on optical discs cannot be overwritten or erased. In addition, optical discs cannot contract a virus or be the subject to a remote data breach. Write once optical discs are permanent and as long as they are safely stored, the content will remain intact for many years to come without worrying whether someone could remotely access, alter, or delete your most important files. In the case of flash memory or hard drives, the content could be accidentally overwritten or infected with a virus that could be passed on to other computers. Secondly, when using optical discs as your archival back-ups, itâ€™s best to ensure that you have discs which have been rated for a minimum of 50 years shelf life. If you use low quality media, the content on the disc could oxidize or become corrupted within as little as 3 to 5 years. So if youâ€™re using optical discs to back up your important data, make sure that your media is going to hold up. Thatâ€™s why we ensure that Vinpowerâ€™s lines of OptoDisc media can last at least 50 years under proper conditions. Thirdly, once youâ€™ve purchased a suitable media, like OptoDisc, and ensured that you properly burned the content you want to back-up and archive, then you need to store the disc(s) in a location that is relatively regulated for temperature, humidity and UV exposure. The good thing is that by nature, optical discs are fairly small and extremely thin, so itâ€™s easy to store a large quantity of discs in a desk drawer or file cabinet. Ideally, the recorded media should be stored at a temperature around 23Â°C / 74Â°F with roughly 50% relative humidity and kept in a dark location that is not overly exposed to sunlight. This is fairly easy by simply storing the discs in a protected cake box or paper sleeves inside a drawer or safe. Lastly, itâ€™s important to check the discs every 5 ~ 7 years by simply loading them in a player or computer to ensure they still play and show the correct files. This way, if you start to see any issues with the media, you can easily transfer the content to another disc without losing any data or lowering the quality of the content. I have had incidents that have happened to me or people I know where the content on their hard drives and even the back-up files on the servers were wiped out because of a virus or hard drive/server corruption. The only reason everything wasnâ€™t lost was because I had back-ups on optical discs, otherwise it would have been a nightmare. So itâ€™s your choice, but isnâ€™t better to spend a short time and some pocket change for the peace of mind that comes with backing up your files on optical discs, or live in denial and suffer the consequences when the unthinkable happens?